Genomic testing has gained significant attention in the last years. In order to learn how oncologists are using the latest NGS technologies in general and multi gene panels in particular, a survey was conducted with the Swedish Cancer Institute in Seattle. The survey of 132 oncologists found that half believe genomic testing value is below expectations. The survey, conducted by Medscape, tried to get insight on how oncologists use next-generation sequencing tests. 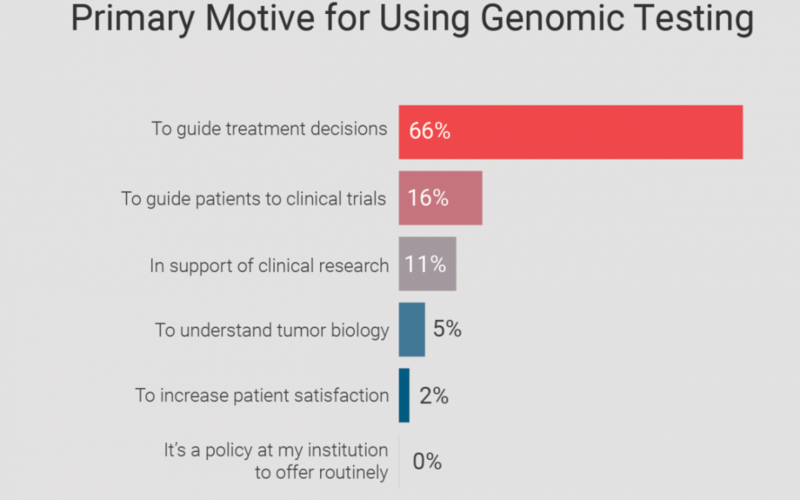 60 percent said genomic testing benefits less than 25 percent of patients and around third of the doctors expressed concern that genomic testing rarely provides clinically actionable, evidence-based information. Despite oncologists’ reticence for NGS testing, around 90 percent had ordered a test in the past five months, mostly when standard treatments options have stopped working, for metastatic patients, and in research. This survey highlights the need to provide oncologists with more actionable information that will complement the NGS offering and enable them to maximize its clinical potential.